In Asian's cooking, normally we used alot of onion and chili paste. Thats apply for me as well, I used alot of this paste to cooks various dish from Tomyam to curry to nasi lemak and so on. But have to make sure this paste are best keep in fridge. 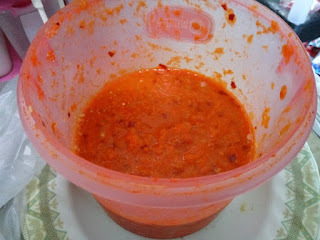 Sorry that the picture didnt look tempting but thats my chilli paste i make in a big bottle. But it does help me save a lot of time when cooking in a hurry. Thats it, blend it together until it looks like paste. keep it in a bottle and put in a fridge. Budu (Jawi: بودو; Thai: น้ำบูดู; rtgs: Nambudu) is a fish sauce and one of the best known fermented seafood products in Kelantan, Terengganu and southern Thailand as well. It is mentioned in A Grammar and Dictionary of the Malay language, With a Preliminary Dissertation, Volume 2, By John Crawfurd, published in 1852. It is traditionally made by mixing anchovies and salt in a ratio ranging from 2:1 to 6:1 and allowing the mix to ferment for 140 to 200 days. 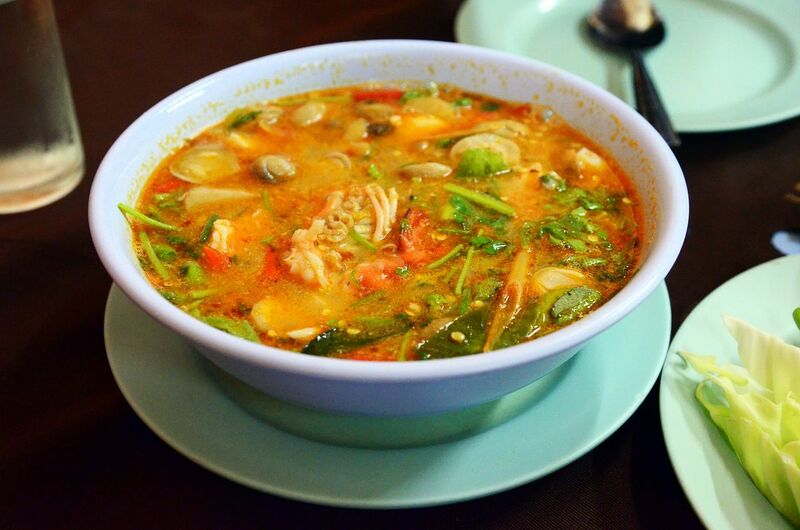 It is used as a flavouring and is normally eaten with fish, rice, and raw vegetables. The fish product is the result of hydrolysis of fish and microbial proteases. The flavor and aroma of Budu are produced by the action of proteolytic microorganisms surviving during the fermentation process. Palm sugar and tamarind are usually added to promote a browning reaction, resulting in a dark brown hue. The ratio of fish to salt is key to the final desired product. Different concentrations of salt influences the microbial and enzymatic activity, resulting in different flavours. The microorganisms found during Budu production are generally classified as halophilic. The microorganisms play important roles in protein degradation and flavour and aroma development. Budu is a traditional condiment in the east coast of Peninsular Malaysia, particularly in the state of Kelantan and Terengganu. Budu has been declared a Malaysian heritage food by the Malaysian Department of National Heritage. Even ethnic Chinese in Kelantan are involved in Budu production. 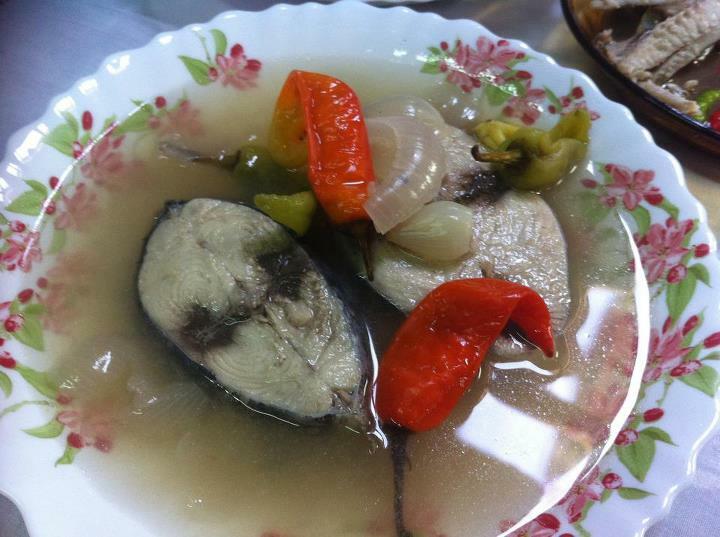 Anchovy and its products like budu are high in protein and uric acid, thus not recommended for people with gout. The uric acid content in anchovies, however, is lower than that in tuna. Budu made from anchovy sauce has shown potential as an anti-cancer agent. Budu also as a food sourced from fish have potential as brain food. 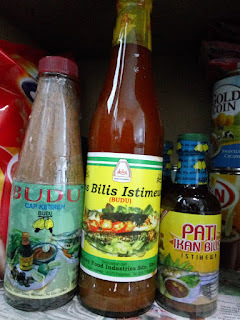 A new form of budu in powder form has been developed by Pa oliteknik Kota Bharu (PKB) student. This allows for easier storage and transport as it is lighter and less prone to bottle breakage. This entry i copied from my old blog. For your information, Kelantan is next to Thailand. Some of kelantanese are siamese and some of us have relatives that reside north of Thailand. So it is common to have similar dishes around here too. For me tom yam also the easiest and comfort food to prepare. bahan-bahan nye yer cik puan sekalian..
memula skali ye cik puan, tumbuk belacan + cili api + bwg2 + cili giling. kemudian tumis kan di dalam sebuah periuk yg sgt besau smpai garing.kemudian boh air smpai 2/3 periuk.agak2 la besau mn periuk tu jgn besau sgt or kecik sgt..bile dah boh air time tu boh la garam gula n kiub..bila dah menggelegak boh la serai and daun limau..tgu la smpai menggegelak boh la lauk tu dlu..
Nasi goreng is a common dish in Malaysia, it can be either breakfast or dinner or lunch. It suits any condition. It is kind of healthy if you put a lot of veggies in it. Name it, nasi goreng belacan, kampong, tomyam and a lots more. For me, working and also a wife I am always chasing with time. However it is, I and my husband prefer to dine at home with home cook. So used some creativity then walla!! 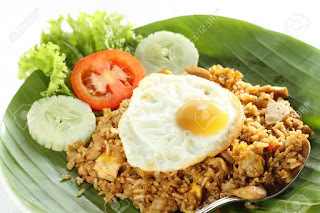 Here you go nasi goreng budu. 5. Once it is dry, make a hole in the middle of rice, crack an egg. 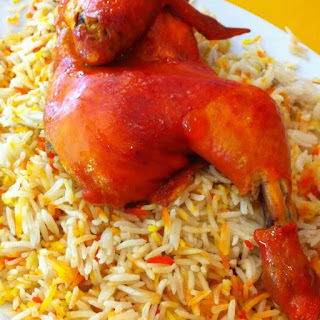 (1) Mula-mula sediakan stok ayam dulu. • Rebus ayam selama 45 minit bersama bahan2 diatas. • Kemudian angkat dan toskan ayam. • Tapiskan air rebusan utk masak nasi. • Ayam yang direbus stok tu akan digunakan untuk buat ayam panggang. • Masukkan stok ayam, apabila didih masukkan beras. • Goreng tanpa minyak bahan2 yg bertanda ** sehingga naik bau dan angkat. • Kemudian kisar bahan ** yang digoreng dgn bahan * sehingga hancur. • Simpan rempah yg telah dikisar didalam bekas yg kedap udara. • Ayam yg telah direbus tadi dilumurkan dgn bahan perapan. • Letakkan atas aluminium foil, balut kemas2. • Bakar dlm oven selama 1 jam pd suhu 180C utk menghasilkan ayam yg lembut. • Kisar semua bahan dengan perahan air lemon, sekejap sahaja. • Jangan sampai terlalu hancur. When the Tummy Singing... You tend to cook your own way and based on available ingredients. Doesn't matter as long as your family enjoy it! I am Kelantanese, so most of the recipe here is Kelantan Dish Delight. Mostly it is comfort food. Enjoy!